Mike & Cara Gangloff - Mulberry Raider from The Wire Magazine on Vimeo. We are extremely excited to be releasing Mike & Cara Gangloff's 'Black Ribbon of Death, Silver Thread of Life' this November 3rd. The record will be released in a run of 500 LPs with artwork by Jake Blanchard and includes a d/l code. 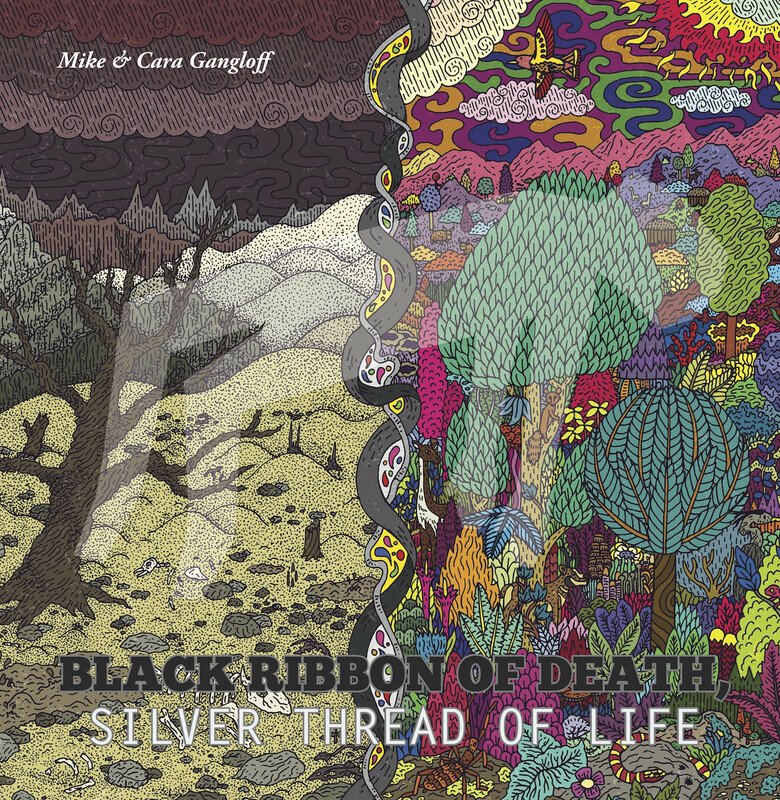 "Mike and Cara Gangloff’s Black Ribbon of Death, Silver Thread of Life is the third in a series of loosely connected melodic investigations released by Mike Gangloff over the past two years. All three were recorded around the Gangloff home in rural Floyd County, Virginia, and were engineered by Joseph Dejarnette (Carolina Chocolate Drops, Bruce Greene, Curtis Eller). And all three feature the far-reaching improvisation familiar from Gangloff’s work with the old-time stringband Black Twig Pickers and the acoustic-drone outfit Pelt. Taken together, they form a musical triptych. Poplar Hollow (Mike on banjo and fiddle, with Cara joining on sruti box) reflects the social fiddle traditions of that part of Virginia, exuberant kick-ups that might be played at a barn-dance or at the country store. Melodies for a Savage Fix (recorded in an all-nighter with guitarist Steve Gunn, and featuring a host of non-Virginian instruments like gongs, tanpura and singing bowls) are the late-night ramblings and conversations that take place well after the dance is over, with dawn drawing nigh. Black Ribbon is an album from the day after, when the cares of the world have again settled in. But though there is woven throughout this album a pattern of fear, loss and regret, it is held together by the warp of tunes and songs marked by joy and hope. The foreboding of Charlie Patton’s “O Death”—sung unaccompanied, in tones caught between resignation and jubilation—is followed by “Rocking in a Weary Land”, where the whirling of hurdy gurdy and the drone of fiddle rise to transcendent heights. The cautionary words of the Carter Family’s “Righten That Wrong” (“If you do wrong today, the price you must pay”), the regret of the18th-century Shape Note hymn “David’s Lamentation” (“Oh my son! Would to God I had died/For thee”), and the apocalyptic visions of “Black Ribbon I, II and III” are offset by expansive, joyful fiddle-and-sruti tunes like “Mulberry Raider” and “West India.” John Fahey, in his notes to the American Primitive collection, posited that the Shape Note songs, spirituals and other religious music of the South were descendants of ecstatic religious practices stretching far back through the mists of Time, that “underneath it all [one can] hear pan pipes tooting and a cloven hoof beating time”: on Black Ribbon, ecstasy can be found in even the darkest of moments, and the silver thread of life shines throughout."